The Print Tech team prides itself on its range of printing, mailing, branding and marketing services. That’s why we’ve built a plant to support our many services. Curious about how we operate on a day-to-day basis? 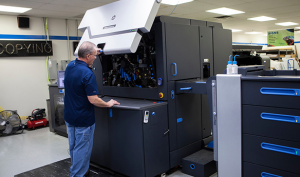 We can give plenty of reasons to schedule a Print Tech tour! Check out our top 10. Sure, you may be in regular contact with your designated Print Tech rep, but our staff is full of individuals who help get your projects done on a daily basis! Meet the faces behind your marketing masterpiece – from the customer service staff to the operators. We hire only the best of the best! Printing is what we’re all about. Looking for a run-down of how we manage to produce high-quality work, time and time again? Any one of our experts will happily fill you in on our history in the printing industry, as well as how the field has shifted over the years. These are no run-of-the-mill presses we’re working with. Take one step into the shop, and you’ll be amazed by what you find. Huge, efficient, top-of-the-line machines fill our plant. Watching the technology do its job is as interesting as it is mesmerizing! Print Tech offers more than just premium printing services! There are so many facets of our company to explore during a tour of our facilities. Check out our mailing and fulfillment options, discover die-cutting capabilities, and speak with our graphic designers about your next big idea. You’ll leave with the knowledge necessary for conquering your next project! Want to learn more about our process for sending out your company’s mailers? Stop by for a demonstration! 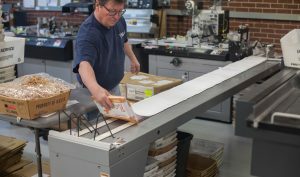 You may catch our team handling bulk mail or professional metering. Or, get a glimpse of how we personalize print projects, like letters and surveys, for optimum response. We’re always working towards better service, knowledge, and quality so we can provide for a wide variety of industries. Ask what our latest initiatives entail to get a sense of who we are as a company! 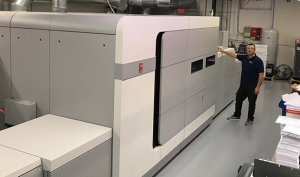 Seeing the Print Tech staff and machines working together to pump out projects at lightning speed may motivate your company to get the ball rolling! Check out some of our signage, promotional material, and designs for inspiration. You may discover a new type of marketing angle that you hadn’t previously considered! What is one of the best ways to get your creative ideas flowing? By viewing some of our in-house samples! Throughout the plant, you’ll find Print Tech branding in full effect. Banners, floor tiles, brochures — take a look at some of the most creative ways we’ve showcased our own logo designs. Then, consider doing the same for your business! That’s right — Print Tech has the only plant on this side of PA with state-of-the-art equipment like the sheet-fed inkjet press. Take a look at its capabilities to see how we set ourselves apart from the competition. Once you experience just how smoothly it operates, you’ll never go back to the regular old machinery! We’ve been in the business for long enough to build an impressive portfolio. If you’re feeling stuck with your current marketing efforts, our print library may help jog your creativity. See how other companies have worked with Print Tech to come up with eye-catching campaigns that drive results. The Print Tech team is always eager to meet our customers! Schedule a plant tour to receive a face-to-face experience that’ll enhance your knowledge and expand your network. We look forward to growing our partnership with your business.